Dona Emma, Number 1 quinoa chef of Salinas! First off, the key to amazing, fresh, nutty flavored quinoa is to wash it well before cooking with it. I usually put my pre-measured amount of quinoa in a bowl and fill it with about twice the amount of water than quinoa. Then with my hands, I rub it together for a minute or less, using medium pressure with my hands. Soon the water turns be a bit cloudy. I pour off this water (using a sieve to catch the tiny quinoa grains) and fill it again. I rub the grains together a bit more. This time the water stays more clear. The quinoa is clean. I drain off this water (don’t forget the sieve) and set it aside. It is ready for most any recipe. I am not home in my kitchen so I cannot try out the recipes exactly, but I’ve been cooking with quinoa for 20 years and can give you some tips based on what I observed here. Feel free to experiment yourselves. Most grocery stores now carry quinoa, usually in the aisle next to the rice. It comes in three main colors: white, red, black and mixed. The black is more nutritious and makes for a dramatic presentation when served. I hear that Japan is wacko over this black quinoa right now! All colors work in all recipes, but I prefer to use different colors for different dishes. The most common way quinoa is consumed outside of Bolivia is prepared like rice (or in the p’ischqa style as they call it here). To make the p’ischqa (quinoa prepared like rice). Simply boil 2 cups of water with a teaspoon of salt added. When the water is at a boil, add the quinoa, stir it around a bit, lower the flame to medium/low and let it simmer partially covered (or uncovered) for about 15 to 20 minutes, or until all of the liquid is absorbed or boiled off. Theh fluff with a fork or mash it around with a spoon (more of the Bolivian way), season with salt to your liking and you are all set. In Bolivia a rich stew of re-hydrated dried llama meet (charque), dried potatoes (chunos), diced fresh potatoes, onions, peas, fava beans, ground powdered yellow and red sweet pepper (aji), garlic is added on top. Or sometimes a thinly sliced pan fried and salted piece of fresh llama meat or grilled llama meat is added, with a few small boiled potatoes on the side. In the US, I often just add a bit of butter to my quinoa p’ischa and it is delicious too. Yum! My favorite use of the red quinoa is in a cold quinoa salad. This I discovered at my local food co-op and it’s been one of my favorites. Simply cook the red quinoa s described above. Then let it sit aside while you add the ingredients – the idea is to do a sweat-sour combo with some texture. The easy way is to add about 2 tablespoons of good quality Balsamic vinegar to about a cup of quinoa, 2 tablespoons of first cold pressed olive oil (in cold salads the quality of your oils and vinegars make a big difference as the flavors stand out more), ¼ cup of fresh chopped parsley, a handful (1/4 cup or less) of sliced almonds, a handful (1/4 cup or less) of raisins or dried cranberries (these look nicer! ), half (or a whole) fresh sliced mango (optional but delicious). Toss it all together and you are done! The taste soaks through it as it sits, so ideally plan to make this about 3 hours before serving so the flavors all soak through. I like to serve it at room temperature too, though it keeps well in the fridge for about a week. Feel free to taste it and adjust it as you wish too. I often make this when I have a last minute potluck to go to that I forgot to get ready for. It is so easy to make, tastes and looks delicious and can be thrown together in just a few minutes! Black quinoa I like to think of as a fancy dessert quinoa. At the Keene State College Dining Hall, there was a rice pudding version made with black quinoa that was outstanding. I would recommend playing around with different recipes. Here’s one I found: http://www.fivehearthome.com/2014/01/11/quinoa-pudding-with-coconut-milk-maple-syrup/ If I was home, I would make it with raw milk from the farmer down the road, add a cinnamon stick and a few cloves while cooking it. And then serve it with a sprinkling of nutmeg. Yummy! Another idea, to bring out the drama of the black quinoa (which has white specs as it cooks) is to add tiny mandarin oranges slices to it. White quinoa is the most common in the US and here in Bolivia too. 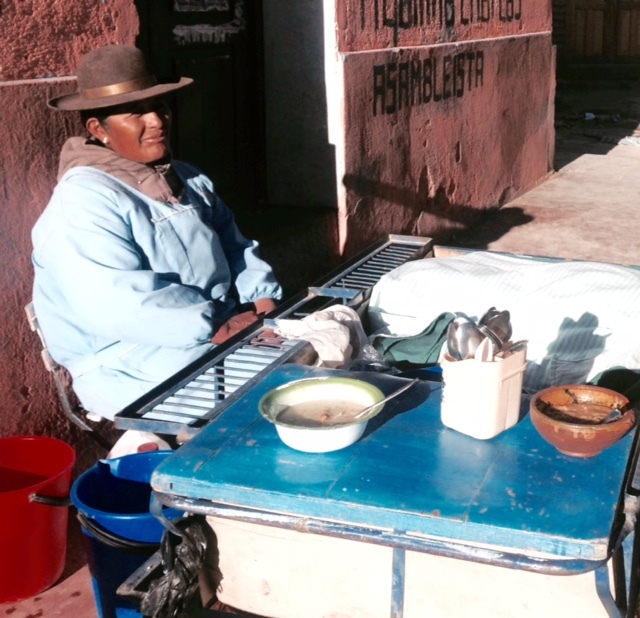 The secret to delicious Bolivian quinoa soup is to slice the vegetables really thin, even grating them. A good veggi combo for 6 cups of soup can be 1 onion, 2 carrots, 3 cloves of garlic. Start out by sautéing these veggis in about 2 tablespoons of oil in the bottom of a cook pot. Then add 6 cups of water, a soup bone and/or stew meat (about ½ cup cubed) – this is optional, and about 5 small fresh potatoes (the Bolivians peel theirs but I like to keep on the skins for the nutrition value – my favorites are the tiny purple or red potatoes) and let boil until the potatoes are almost done (about 10 min.). Then add 2 cups of quinoa and let cook another 15 min. Extra ingredients can be added at this time too such as corn, peas, and small cubes of butternut squash. As a special treat, you can also stir in ½ cup of fresh chopped spinach. To serve the soup, cut one of the boiled potatoes in half and place both halves in each bowl. Pour the soup over this and garnish it with parsley. 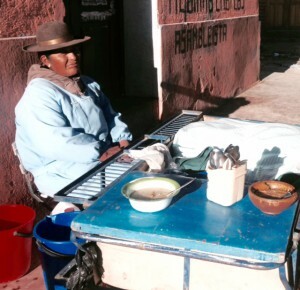 Bolivians like to eat this soup as a morning belly warmer and also as a favorite lunch dish. In the city they will often have a fresh roll they will dip in the soup as they eat it. Most folks will also add a generous teaspoon of fresh, hand-ground hot sauce to their bowl of soup. Provecho! (good eating).